Denied a populism from the left, millions of Americans picked the one from the right. The specter haunting our centrist press wasn’t Trump, whose candidacy would never have lasted past the first primary without the constant promotion of a slavish media. Nor was it Sanders, whose insurgent campaign was dismissed and deprecated by the same corporate media that mostly ignored him for as long as possible. No, what really worried the establishment was the people themselves, and the thought that after decades of being offered a forced choice between two paths to their own extinction—the gently managed, technocratically assisted suicide offered by the Democrats, or the savage Darwinian winner-take-all sweepstakes of the Republicans—working-class Americans might do more than simply stay home. They might refuse to play along. Hillary Clinton, with a little help from her friends at the Democratic National Committee (and a tag team of wised-up liberals in the media), managed to contain the threat of Sanders’s political revolution. Clinton then went on to wage a campaign that, though genuinely inspiring to millions of women, offered the rest of the electorate little more than the promise of four more years—with the threat of President Trump to herd them into the Democratic camp. But with the exit on the left thus blocked, the millions of Americans who wanted real, radical change—rather than the ethical alibi offered by third parties—were left only with an opening to the right. We all know what happened next. Populism—the political and cultural revolt of the people against the elites—has had bad press in this country for over 100 years, ever since the Republican Party assembled a vast corporate war chest to defeat the threat posed by Populist-Democratic fusion candidate William Jennings Bryan in 1896. And some of that bad press, it should be noted, has been earned. Tom Watson, the fiery Georgia newspaperman who ran as Bryan’s running mate on the Populist ticket (but not the Democratic one), and who had built his career on uniting poor white farmers and black sharecroppers against the South’s feudal landlords, turned into a rancid demagogue after that defeat, spouting racist abuse against blacks and whipping up the anti-Semitic mob that lynched Leo Frank. But in giving ordinary Americans not just the wherewithal to see how the system was rigged against them—and by whom—but also the intellectual resources and cultural confidence to stand up to that rigged system, populism represented “a political, an organizational, and above all, a cultural achievement of the first magnitude.” That quote is from historian Lawrence Goodwyn, whose book The Populist Moment remains the essential text for anyone seeking to understand what change from below actually looks like in America, how it begins and spreads, and what can happen when that impulse gets thwarted by a political system that keeps the levers of power as far from the people as possible (which is the running subtext in so many of the leaked e-mails from the DNC). Elites fear populism because they can’t control it. But democrats (lower and upper case) should embrace it. Of course Trump isn’t really going to overthrow the system. Paul Ryan and the rest of the Republican loyalists in Congress will never allow that. But it will be interesting to see how far the man who, at the Greenville debate last February, described the GOP as the tool of “special interests and lobbyists” and decried corporate America for stashing “$2.5 trillion offshore” will go to redeem his rhetoric. Will he keep his promise to close “the carried-interest deduction and other special-interest loopholes that have been so good for Wall Street investors, and for people like me, but unfair to American workers”? Will the president who told voters that George W. Bush lied us into war in Iraq now tell the truth about the cost of America’s imperial entanglements? Or will a frustrated Trump, who campaigned on a platform of racial resentment, sexual panic, fear of immigrants, and a collection of pie-in-the-sky promises reliant on voodoo economics for funding, blame his own failures on the few restraints on executive authority remaining after decades of imperial presidency? Because the critics of populism are right about this much: Playing bait-and- switch with people’s hopes and lives is a dangerous game. All across Europe, countries that seemed on the cusp of their own populist moments­—from Syriza in Greece to Podemos in Spain, to Beppe Grillo’s Five Star Movement against Berlusconi in Italy, to Poland, whose workers demolished Stalinism with Solidarity (a development which, interestingly, formed the subject of Goodwyn’s 1991 book Breaking the Barrier) only to recently transfer their loyalty to the far-right Law and Justice Party—now teeter on the dark edge of an authoritarian abyss. Gramsci warned that when the old order “is dying and the new cannot be born…a great variety of morbid symptoms appear.” Or to put that in plain American, when people feel shipwrecked, they are liable to grab onto anything to keep afloat. So perhaps a little humility is in order. Instead of dismissing Trump’s victory as merely a triumph of Know-Nothingism, or white privilege, or male-chauvinist aggression, maybe we ought to start not just listening, but trying to hear what some people have been trying to tell us for months now. Like the packinghouse workers in Iowa who have seen their wages undercut by employers who would rather recruit immigrants than pay American workers a living wage. Or John Fetterman, the mayor of Braddock in Western Pennsylvania, who endorsed Hillary Clinton but warned me back in March that corporate Democrats like Clinton and Katie McGinty would never win over the busted steel towns along the Monongahela River. Or the auto workers in Ohio and Michigan who never bought Clinton’s change of heart on the Trans-Pacific Partnership. 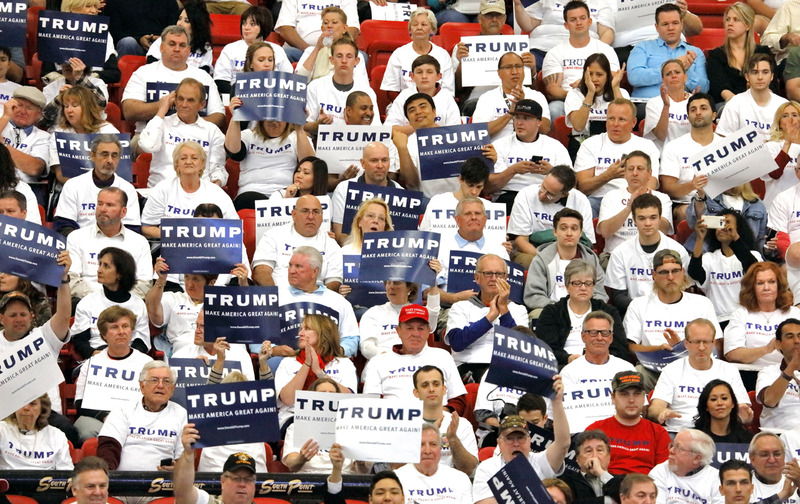 Some Trump voters probably were motivated by racial hatred—and many more by the fear of losing the one shred of dignity they thought came from being born white. And some simply voted their economic interests—or their conservative convictions, like the Republican judge in Texas who told me she was “disgusted” by Trump’s conduct and campaign but, “much as I dislike Donald Trump, from my perspective and political sensibilities he has maybe a 5 percent chance of doing something I will agree with—including not enshrining a clearly left-leaning Supreme Court. Hillary Clinton’s chances are roughly zero.” It wasn’t just us leftists who viewed this election as a choice between two evils. Writing off every Trump voter as racist, or irredeemably reactionary, might be emotionally satisfying. But it would be politically stupid—and potentially disastrous. For all her faults, Clinton still managed to convince a nearly a million more Americans to vote for her. And while racism is indeed “baked in” to our history, from slavery and the three-fifths clause in the Constitution to stop-and-frisk and the prison-industrial complex, so is the legacy of resistance, from the abolitionists—black and white—who defied the Fugitive Slave Act, to sanctuary cities, Black Lives Matter, and the allies who turn out in support of all those threatened by Trump’s victory. Elites fear populism because they can’t control it—or channel it toward more “acceptable” aims. But democrats—lower or upper case—should embrace it. Because throughout our history, when populism fails, oligarchy profits. And because while the right might prefer aristocracy, or a plutocracy in which the business of America really is business, we on the left can’t just dismiss the people—no matter how much they may disappoint us. Petulance is not politics. Slice and dice the exit polls any way you like, but there is absolutely no evidence that most Trump voters wanted the Republican Party program we are likely to see emerge in the coming weeks. In opposing that program, we need to peel off whatever disillusioned segments of the electorate we can—groups that could easily amount to a majority by 2018. In the meantime, if “Trust the People” seems like too much to ask, we should at least listen, and learn. And realize that the only way to defeat the false populism of bigotry and xenophobia is with the genuine article. Editor’s note: An earlier version of this article incorrectly stated that the majority of Americans voted for Hillary Clinton. The piece has been updated to correct the error.